ROSEMARY HARRIS: Here he is, the first guy I ever went to bed with, and still the longest relationship I've ever had. Meet Cubby. 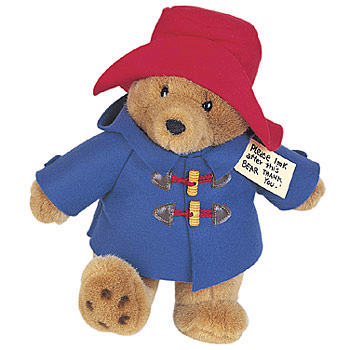 Do you still have your first teddy bear? Or doll? And has anyone seen the movie Ted? HANK PHILLIPPI RYAN: Aww. It makes me miss Cinnamon, my Steiff plush horse. Which I loved. I LOVED. I can still almost feel how comforting it was. And Cinnamon wasn't one bit cuddly. She was elegant and sleek and the color of--well, you know. And sometimes my baby sister Nina called her Synonym. Which even now is pretty funny. I really didn't understand the doll thing. I had some, but we never really got along. As you can see from this photo. ROSEMARY: You dated Richard Holbrooke...? HANK: Oh, yes. A story for another blog. He was brilliant. DEBORAH CROMBIE: My earliest memory is of sitting up in my crib when I was supposed to be napping, playing with my stuffed animals. No dolls for me, ever. But I didn't save any of them, although I do still have daughter's favorite blue "Horsey." I've made up for not keep the childhood friends by replacing them. On my bed are Gordon the teddy, Paddington (the proper Paddington in his original coat), Bob the green elephant, Tosh the German shepherd, and Leo the hippo. Some of you may remember Leo, who is now a star in his own right. Oh, and my first record was "The Teddy Bear's Picnic", sung by Bing Crosby. I think it gave me nightmares. HANK: Yes, Debs, that song is CREEPY. HALLIE EPHRON: So boring, I did not bond with stuffed animals. Or play with dolls, other than to dress and undress them. I did have a baby doll -- rubber (I remember the taste of her foot) legs and arms with a stuffed cloth body. I think I lost interest in her when my little sister was born. Otherwise I was much more into games. Parcheesi. Careers. Monopoly. My parents moved when I was in college and anything that I didn't have at college with me got swept away. RHYS BOWEN: I never had a teddy bear. Sob. Because in those post war years of austerity in England you couldn't buy nice toys. So for my 21st birthday my mother bought me Henry Bear at Hamleys on Regent Street. She spent hours looking at bears until the store clerk said, "Madame, what exactly are you looking for?" and my mother said indignantly "A bear with a nice smile, of course." LUCY BURDETTE: Oh this post makes me sad...I had a wonderful collection of stuffed cats. My parents gave me a new one for Christmases and birthdays. They were all different colors and personalities and their coats were made of rabbit fur. (I know...) My first one was called Fuzzy Wuzzy. Then came Wuzzy Fuzzy, Tangerine, Licorice, and Queenie (who was attached to a little red heart pillow) and more. But when I lived in Florida for graduate school, we had a terrible battle with roaches. One day I looked in the closet where they were kept and found that the roaches had eaten off every bit of fur. All I had left was a collection of pitiful bald animals. I kept them for a while but was finally persuaded to throw them out--I had to agree that absolutely no one else could find them appealing. 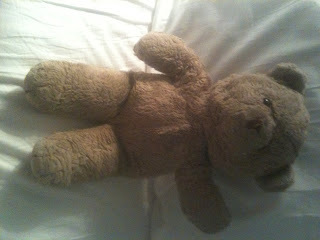 ROSEMARY: JR readers, send me pix of YOUR teddy bears ( rosemary@rosemaryharris.com) and I will post on Sunday. One lucky winner will receive an advanced readers copy of Hank's new release The Other Woman. "I remember the taste of her foot"
Read this with a mouth full of coffee. One new keyboard, please. I'm told I had a teddy bear but I don't remember it but I do remember having a Raggedy Ann. I got another one in Seattle and she sits in my bedroom. As for Teddy Bears Picnic. I love that song. I remember having a "toy" record player and this record. I think it was big & yellow! Rosemary this is a very sweet post. Thank you. I am sending you two photos, because I cannot choose between Abigail and Teddy. Abigail was my best friend who kept me company when I had the measles. She met an unfortunate end one day when I left her outside. Her face melted and slid off onto the grass. I've never gotten over it. My father brought me Teddy from Belgium. He said he had to stuff him in the ship's smoke stack to get through the customs check. I wasn't sure what he meant then, but I get it now. Teddy could not replace Abigail, of course, but he was very cuddly and made soft growly noises when I hugged him. He saw me through polio. He had a tragic demise, as well, when Johnny Coburn threw him down the outhouse at my great-grandmother's camp. Poor Teddy. Poor Johnny. The Paddington Bear reminds me of one I made for one of my daughters (but it didn't have the cool peacoat). And I made a Winnie the Pooh for my oldest daughter, which is still around. Her son loves to sleep with it when he stays with us. I wish she still had the Raggedy Ann I made for her; it was a work of art and a labor of love, complete to the embroidered heart and frilly white pantaloons. Her stepmother pitched it, durn it. I don't think I have any pictures of the only stuffed critter I remember, but I have no idea what it was meant to be: bear, kitty, dog? No clue. It was made of rabbit fur, which Hallie's "I remember the taste of her foot" suddenly brought to mind, since it had a distinctive smell and taste when it was wet. Did I chew the thing? Who knows. That memory is also lost to the mists of time, I fear. This is a wonderful post, Rosemary. Thank you. "A bear with a nice smile, of course." Who, I ask you, could stand against a mother in search of the perfect bear for her daughter? I love this story, Rhys. It reminds me of standing in monster lines for hours to get Cabbage Patch dolls just because my children wanted them. I remember having my own dolls back in the day [most notably a Shirley Temple doll], but, alas, all of my childhood treasures seem to have vanished with time. My mom had a small collection of stuffed animals that held court on her bed [or on the hope chest when she slept] and several of them have now come to live in our home . . . . The Princess never met a stuffed animal she didn’t love and just had to have, so she has more teddy bears, kitty cats, dogs, and the like than all the rest of us put together. My personal favorites are my Cabbage Patch astronaut doll [a girl, of course] and a gorilla dressed in a spacesuit, both of which traveled to schools with me when I used to do moon rock programs. They were almost as much fun for the children as the moon shoes and the microscope they used to look at moon rock and soil samples. Mine was Paul Mitchell Bear - a red velveteen bear that I got from my hairdresser. He had a bow around his neck advertising Paul Mitchell's hair products - and obviously I expended a lot of creativity naming him, ha! Oh, Rhys, I love your story. Your mother must have been quite something. And I LOVE Hamlyn's. A child's dream of a shop. You all know, of course, that the first thing I do when I arrive in London via Paddington Station is take a photo of the Paddington Bear stall. It seems to be my good luck talisman. I never saw a plush horse in my childhood, not even in KY, where you can now find them all over the place. When I was 4, Santa brought what I later learned was an early Breyer horse, a plastic faux wood-grain Arabian stallion that I named after a friend's horse we'd seen run at a family trip to Cincinnati's River Downs. I slept with Monsouri, who had a bad habit of falling out of bed and clunking up against things. He went to the hospital with me for my tonsillectomy when I was 5 and then on to my college dorm room. He's sitting on my sideboard now. If he weren't so scarred up from years of falls and travel, he'd be worth about $50+ to collectors. But they'll never get their paws on him. Never, never, never - not as long as I draw breath. I had Topsie, who might have started out as a plush dalmation (dog, not bear) and soon had very faded spots. The underside of his long floppy ears (maybe he was a cocker spaniel?) were so smooth to fondle, they were my blankie. I was very proud of the surgery I did on his stomach one summer, and he still resides on my mother's child-size wicker rocking chair. Love to hear all these memories from the Jungle Reds! I don't remember having stuffed toys or dolls, but I do remember making doll clothes for my baby sister's dolls. I was a tomboy as a kid, played football with all my younger brothers and their friends and read when I wasn't playing with the boys. I never had a Teddy bear, though I made them for all my kids (and rag dolls and all kinds of stuffed toys). A few years ago at Christmas time I saw a lovely bear with a big red velvet bow around his neck and bought him for myself. I knitted him a red alpaca hat, and he sits on the mantel at Christmas and in my office the rest of the year. I had a stuffed monkey, named Cheeky. Now I have a bear named Elvis, a gift from my husband when I had to have a cat scan because I'm claustrophobic. However, Bill is the bear that our house revolves around. He's been my daughter's since the day she came home and thanks to her vivid imagination he has a very busy life. Not many people have teddy bears that are lactose intolerant. I still sleep every night with my Lone Ranger action figure. He is not a doll. Like Hank, I never really understood dolls. My mom kept giving me beautiful dolls and then would have hurt feelings because they just stayed in the box. After Donald and I were married I sold those very same dolls - still in their boxes - and got a tidy little sum. I do have a doll now though. And one I love to pieces. Her name is Eloise! She's 6! (more about Eloise when I have my next turn here at Reds). She's a soft cloth doll and she sits on a bookcase and sometimes wakes us up at night getting into mischief. But stuffed animals, oh my. I was (and still am) a sucker for stuffed animals, especially bears. Ro - I've sent you a picture of some of them. They sit on the back of the sofa in our sun room and they're a happy group. One of them looks exactly like a bear posted here today - except mine is wearing a tiara. Jack - you made me spit coffee through my nose. And oh yes - that "I remember the taste of her foot" remark will live in my mind for a very long time. I had a 3 foot long, stuffed, plaid flannel dachshund. My Great Uncle Gigi had it in the rear window of his car for years and all of us kids coveted it. When I was 4 years old he drove my Mom and me to an eye exam at Mass Eye and Ear and when we returned home he gave me that wonderful dog as a reward for my good behavior. I named the pooch Gigi and I dragged him everywhere even though he was a bigger than me. When I was older he took up residence at the foot of my bed. I loved him for 50 years until the flannel disintegrated to the point where all I had left was his bead eyes and a pile of stuffing. Sadly he had to go. Lucy - yes! The trolls! And they each had a jewel in their belly button which was the same color as their hair. Linda - I'm not sure if we ever made doll clothes, but my brother & I did make clothes for Santa's elves. Snoopy! Any Snoopy lovers out there? Mine had a red nightdress and cap and reclined in the exact center of my pillow. Even more than Snoopy, however: my Chrissie doll. Anyone remember the dolls with hair that got long and short? I loved mine to pieces. My aunt made her a wardrobe of groovy minidresses that was the big gift ever. I still have my William Shakesbear teddy from when there was a company that made teddies with all these famous forebears (Humphry Beargart). He's a little dusty, but neatly dressed in his Tudor hat and court dress-I can't seem to let him go. Lisa, I remember Crissy. Not only did I want the doll, I wanted to have hair that would easily go from short to long. My hair was unruly as a kid (curly, crazy, tangled, you named it), so I longed for sleek hair like Crissy's. I used to create the most elaborate hairdos. Rhonda, I live a mere two miles from River Downs! Lil! I have Humphrey Beargart and Laureen Bearcall! Yep - a wee bit shopworn, but I can't part with them either. I don't recall having stuffed animals when I was growing up, but I suspect that any I had were passed down to my four younger siblings. I DO remember a rubber duck and being very sentimental about it! I was miffed when my mother threw it out when I was in high school! Dolls: yes,I did have them. I specifically remember a Ginnie doll. Also,there was an old doll passed down to me by my dad's aunt when one of her kids outgrew it. (Some of Dad's cousins and siblings are close in age to me,maybe 10 or 12 or 13 years older than I am.) I LOVED the doll. It had a cloth body and a ceramic head. I still kept it on my bed when I was about 14 or 15. Via Facebook I have been catching up with one of Dad's cousins...the one who was the original owner of the doll and other things her mom gave us. She said "so THAT's where our toys ended up!" Stuffed animals in adulthood: I have come into some bears and a couple of dogs within the past twenty years or so. The dogs were gifts. Their names are Oliver and Willa-Judith. I am not sure where the bears originated but I think I bought two of them at a craft store with the intention of dressing them up. Those two are identical twins named Trevor and Duncan. Because I can't tell them apart, I finally had to put their initials on their little red bowties. They have a younger sister named Melanie-Helaine, who just appeared out of nowhere in my home a few years ago. I think she has actually lived with me for about twenty years, but very quietly. She wears PJs with a matching night cap. And for the past few years I have been running a Reform School for Badly Behaving Stuffed Animals. My youngest niece always used to tell me wild stories about the trouble her stuffed animals were getting into. They now take turns coming to live with me so I can retrain them. I send her letters detailing their progress. And I just received a new bear for Christmas. She is really pretty, and her name is Mary Roberta. Kaye & Lil - Apparently the Target dog comes in little stuffed caricatures now. My sister has a collection of them, including Prince William and Princess Kate. Lisa, that doll with the changeable hair was called Tressy. Never had one but always wanted. Debs - yup the Bing Crosby version is a little scary. It's his deep voice and the background singers sound like the harpies in the Wizard of Oz. And Jack...does Tonto know about this? I had that Okapi! My mother loved going to FAO Swartz every year (She went on "the company plane" at 8am and was back in Pennsylvania before my siblings and I got home from school, so it was a little like Santa's magical trip.) My bear was a stuffed koala that my aunt brought back from Australia. I'd take his picture right here on the shelf behind my desk, but my camera battery is dead. Richard Holbrook! That won't ever be a blog, will it? Because you're so nice, Hank. YOu had the okapi, Nancy! Whoa. That is AMAZING..
And Hallie--I cannot begin to tell you how quickly I decided to go to Ebay and get the Cecil. And cannot begin to tell you how just as quickly--Jonathan looked at me as if I had lost my mind. I am a Snoopy lover! Although I have never had any Snoopy stuffed animals I DO have Snoopy tree ornaments. Hank...I have been trying to figure out what you are doing in that photo? That IS a childhood pic of you, isn't it? Yes--it's me. I am TRYING to change the doll's clothes. But I could never figure out how to do it. I had Pink Puppy when I was very young, but my mom was terribly efficient at throwing away "lovies" when we were officially too old for them. I don't even want to talk about the trauma of losing my "red" blanket (which was actually multicolored squares and threadbare because I picked & flicked the pills). On my high school senior class trip, I bought a pink teddy bear and named him Twicket (I got it at Great America and there were signs everywhere to "validate your Twicket" so you could return the next day for free). I don't remember sleeping with a stuffed animal when I was young, but that bear went to college with me and got me through a week long inner ear infection (= no balance, = stay in bed). I slept with it well into my twenties. Twicket rode home from college on my lap - on the bus. I took him to California when I was 25. I still have him, but he's in sad shape. He's a bit flat, an eye is missing, his nose is mostly rubbed smooth, and there are a number of holes where the seams are coming apart. He's only really pink in the creases. But I love him, and I have, on bad days, pulled him out for a nap. One bear I had was white and I named him Cupcake. I think he wore a Pillsbury (like the doughboy) bib. I had a large life-sized doll that was big enough to dance with and I named her Suzie Q and later I changed it to Cindy. My mother had a teddy bear from her childhood and it must've been from the 1940's. It's probably up in the attic and Cupcake's probably there too. I had lots of stuffed animals and still do, including Beanie Buddies and Beanie Babies. I remember some big bunnies I had that had stirrups on their feet so you could put your feet in and dance with them.